I’m lucky enough to teach a graduate course in poetry for children and young adults again this spring. 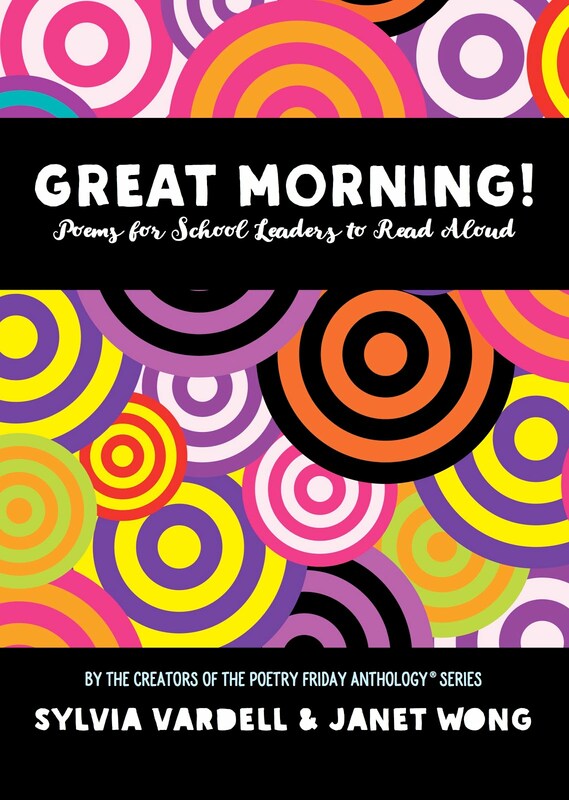 It’s such fun to dig deep into all kinds of poetry published for young people and usually quite an eye-opening experience for my students. 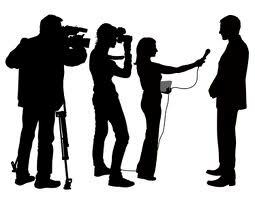 I also try to involve them in sharing their new knowledge with the world at large whenever possible. This year, I’ve arranged for them to interview poets via email with a focus on poets who have new books out in 2012. We’re using the "Five Question Interview" format based on the model that Roger Sutton, Editor of Horn Book Magazine, initiated in his many interviews with children's book authors and illustrators (many of them LIVE at ALA conferences). I wrote him for permission to use this format and he kindly agreed. I’m calling it our 5Q Poet Interview Series. Since there are only 5 questions, I told my students that they need to be good ones-- not just "where do you get your ideas," etc. And they should focus specifically on the new poetry book out this year and not just on writing in general. However, in several cases the 2012 books are/were not available yet, so my resourceful students did all they could to find out as much as they could. 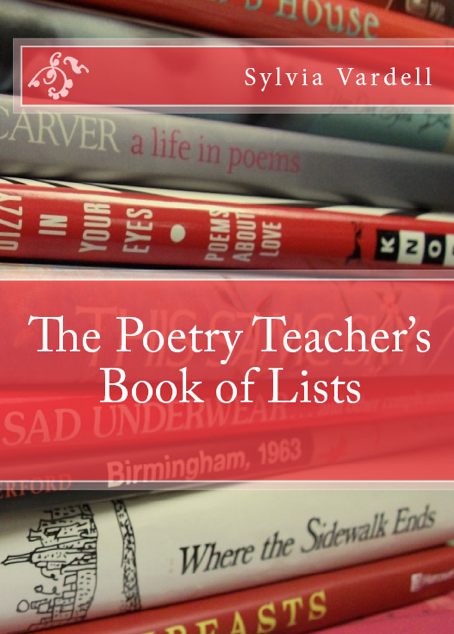 What follows is the list of poets, 2012 poetry books, and student interviewers that we will be featuring on my blog every day throughout April, in honor of National Poetry Month. April 1: Kate Coombs. Water Sings Blue: Ocean Poems. Interviewed by Mary Virginia Meeks. April 2: Jill Corcoran, Ed. Dare to Dream… Change the World. Interviewed by Lindsey Chesser. April 3: Margarita Engle. The Wild Book. Interviewed by Rebekah Espinosa. April 4: Sid Farrar. The Year Comes Round: Haiku Through the Seasons. Interviewed by Katelyn Verrill. April 5: Douglas Florian. Poem Runs; Baseball Poems and Paintings. Interviewed by Dori Pruzan. April 6: Douglas Florian, the Sequel. Unbeelievables: Honeybee Poems and Paintings. Also interviewed by Kristin Edstrom. April 7: Helen Frost. Step Gently Out. Interviewed by Emily Felker. April 8: David Harrison. Cowboys. Interviewed by Shandra Harrel. April 9: Artist Dan Burr, illustrator for Cowboys. Interviewed by Jenny Davidson. April 10: Georgia Heard. Ed. The Arrow Finds its Mark: A Book of Found Poems. Interviewed by Kori Parkinson. April 11: Stephanie Hemphill. Sisters of Glass. Interviewed by Yours Truly. April 12: Lee Bennett Hopkins, Ed. Nasty Bugs. Interviewed by Melissa Scholl. April 13: Carol-Ann Hoyte and Heidi Bee Roemer. Eds. And the Crowd Goes Wild! : A Global Gathering of Sports Poems. Interviewed by Abby Hancock. April 14: Dana Jensen. A Meal of the Stars; Poems Up and Down. Interviewed by Yours Truly. April 15: J. Patrick Lewis. Edgar Allan Poe’s Pie: Math Puzzlers in Classic Poems. Interviewed by Dana Terrell. April 16: J. Patrick Lewis and Jane Yolen. Last Laughs: Animal Epitaphs. Interviewed by Tammy Reed. April 17: J. Patrick Lewis and Jane Yolen, Together Again. Take Two! A Celebration of Twins. Interviewed by Jerusha Hunt. April 18: J. Patrick Lewis, Redux. If You Were a Chocolate Mustache. Interviewed by Kara Johnson. April 19: Timothy McLaughlin. Ed. 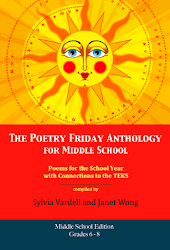 Walking on Earth and Touching the Sky; Poetry and Prose by Lakota Youth at Red Cloud Indian School. Interviewed by Stephanie Cacciavillani. April 20: Lesléa Newman. October Mourning: A Song for Matthew Shepard. Interviewed by Brittany Snyder. April 21: Eric Ode. When You're a Pirate Dog and Other Pirate Poems. Interviewed by Melissa Quisenberry. April 22: Caroline Starr Rose. May B. Interviewed by Brooke Adams. April 23: Michael J. Rosen. Running with Trains, A Novel in Poetry and Two Voices. Interviewed by Chrissy Adkins. April 24: Marilyn Singer. Every Day's a Dog's Day: A Year in Poems. Interviewed by Liseth Martin. April 25: Marilyn Singer, Part II. The Superheroes Employment Agency. 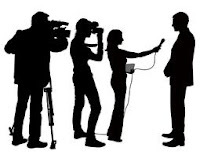 Interviewed by Carrie Martin. April 26: Amy E. Sklansky. Out of This World: Poems and Facts About Space. Interviewed by Garra Ballinger. April 27: Janet Wong. 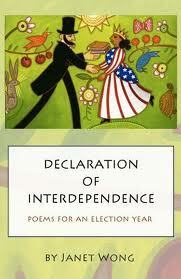 Declaration of Interdependence: Poems for an Election Year. Interviewed by Jessica Pollock. April 28: Jane Yolen. Bug Off! 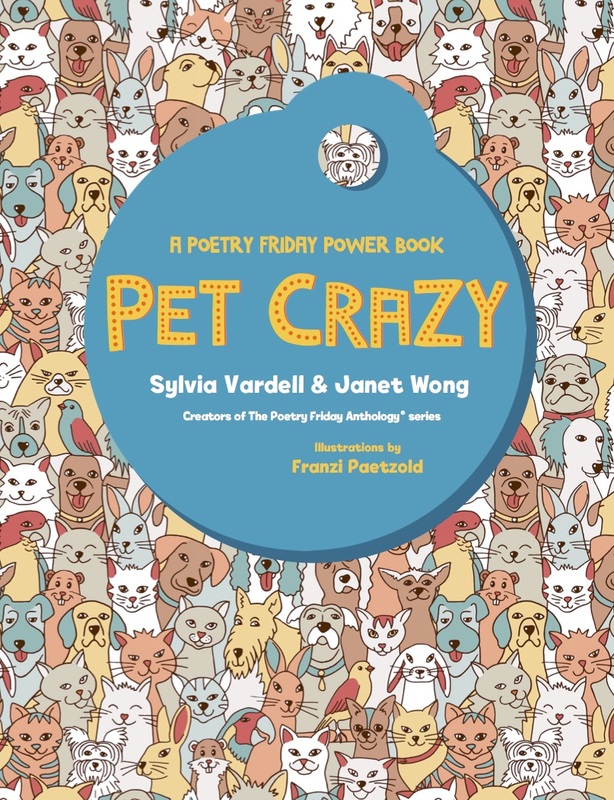 Creepy Crawly Poems. Interviewed by Lisa Cockrell. 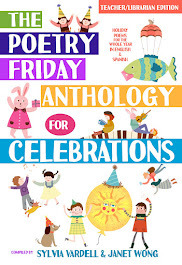 April 30: Two bilingual poetry books to celebrate El día de los niños/El día de los libros/ Children's day/Book Day: Con el sol en los ojos/ With the Sun in My Eyes by Jorge Luján AND Guacamole; Un poema para cocinar/ A Cooking Poem by Jorge Argueta. Lots of poetry wonderfulness to look forward to every day in April. Stay tuned! (10.) 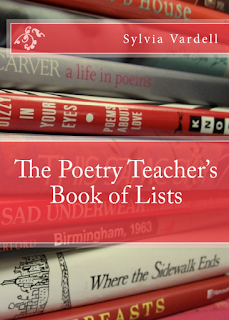 General Poetry Teaching Resources. 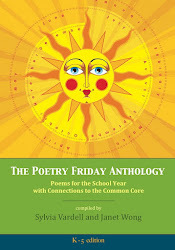 You’ll find recommended lists of poetry books tied to calendar events throughout the year, poetry that targets the needs of students acquiring English as a new language, poetry to help children through worries, adjustments or difficult times, 20 lists of poetry to support the study of science, social studies, and language arts, lists organized by different poetic forms, question prompts to guide meaningful discussions, preparation and presentation pointers, display ideas, poetry quotes, lesson plan tips, poet birthdays, and a poetry scavenger hunt and treasure hunt for kids—all tools to help jumpstart a poetry program and keep it energized and fresh all year long. Click here to check it out! 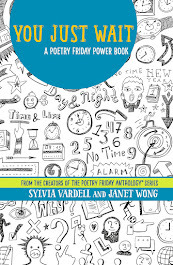 Meanwhile, swing by poet Heidi Mordhorst's blog, My Juicy Little Universe, to join the Poetry Friday crew this week. See you there! For those of you who commented on my "election year" post last week, the winner of the free Janet Wong books is Elizabeth McBride. 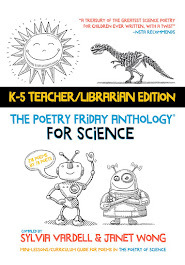 Thank you also, Mary Lee, Myra, Keri, Laura, Charles, and Mrs. Davis for reading and commenting. If you will each send me your mailing address, I'll send Elizabeth her prize and each of you one of the extra ARCs (advance copies) or poetry paperbacks I have. Just write me at svardell AT Gmail DOT com. 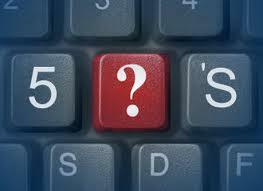 Coming soon: My 5Q Poet Interview Series-- a poet a day for April! I have a free copy to share (along with an autographed copy of her autobiography for kids, Before It Wriggles Away) to a commenter on today’s post (chosen at random). Meanwhile, here’s my current list of patriotic poetry for kids. Please let me know any book titles I can add to my list. Thanks! Poets have written about pride in homeland, about the search for a national identity, the value of one’s cultural heritage, and finding a place in an adopted country, among other patriotic topics, for many generations. How has this been expressed in poetry for young people? Here are a few outstanding examples. Burg, Ann. 2009. All the Broken Pieces. New York: Scholastic. Clinton, Catherine. 1998. I, Too, Sing America: Three Centuries of African American Poetry. Boston: Houghton Mifflin. Cohn, Amy L., comp. 1993. From Sea to Shining Sea: A Treasury of American Folklore and Folk Songs. New York: Scholastic. Greenberg, Jan. 2001. Heart to Heart: New Poems Inspired by Twentieth-Century American Art. New York: Abrams. Hopkins, Lee Bennett, Ed. 1993. Beat the Drum, Independence Day has Come: Poems for the Fourth of July. Honesdale, PA: Wordsong/Boyds Mills Press. Hopkins, Lee Bennett, Ed. 1994. Hand in Hand: An American History through Poetry. New York: Simon & Schuster. Hopkins, Lee Bennett, Ed. 1999. Lives: Poems about Famous Americans. New York: HarperCollins. Hopkins, Lee Bennett. Ed. 2008. 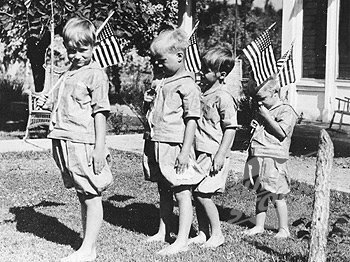 America at War. New York: McElderry. Meltzer, Milton. 2003. Hour of Freedom: American History in Poetry. Honesdale, PA: Wordsong/Boyds Mills Press. Philip, Neil. (Ed). 1995. Singing America. New York: Viking. Testa, Maria. 2005. Something about America. Cambridge, MA: Candlewick. Wong, Janet. 2012. Declaration of Interdependence. Poems for an Election Year. PoetrySuitcase. 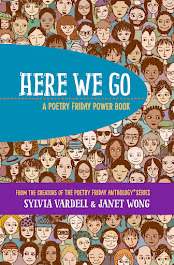 Join the rest of the gathering at Poetry Friday hosted by Greg at Gottabook. See you there! 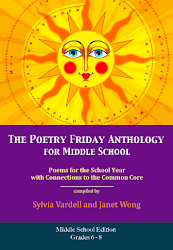 In my quest to keep you posted on all the poetry titles that are garnering special recognition, please allow me to “toot my own horn” about my Librarians’ Choices book review project, now in its 8th year. The Librarians’ Choices project involves volunteer teachers, librarians, and library professionals in the Dallas/Fort Worth (Texas) area who spend the calendar year reading and discussing hundreds of new books for children and young adults provided by major publishers. Participants determine which titles are most outstanding based on literary quality, appeal to children and young adults, the typical needs of a school or community library, and a comparative study of other professional review sources. In the end, we focus on developing a list of 100 titles, with approximately half of the list being designated for picture books or books for children and half of the list designated for novels or works for young adults. Poetry and nonfiction titles are also incorporated as appropriate and we also actively seek out works with multicultural content. Then each participant reviews a subset of books including compiling a complete bibliography of each title with a description and analysis of the book, as well as connections for sharing the book with child/teen audiences and recommendations for related books to combine or compare with the featured title. You’ll find all seven years of our recommendations and guides here. 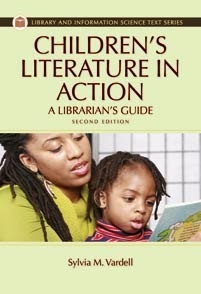 The goals of the proposed session are twofold, to develop knowledge about current books for children and young adults and to think critically about these books and to share a professional resource for anyone interested in keeping up with the outstanding and intriguing books being published for the young people they serve. 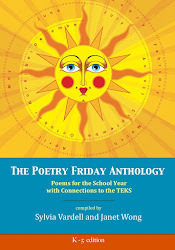 I’m pleased to showcase our recent 2011 selections and especially proud that our list includes these 17 poetry books.